S Waves are a type of seismic wave called a body wave - they are called this because they travel through the body of the Earth. See surface waves. 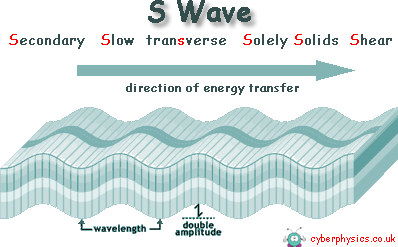 S-Waves are Secondary or Shear waves. They travel Slower than P-waves. As an S wave is slower than a p-wave it therefore arrives at the detector in second place. For this reason, S waves are called secondary waves ('cos they arrive second!). They travel to right angles to the vibration of the particles - they are tranSverse waves. In transverse waves, the medium vibrates perpendicularly to the direction of energy travel. .
S-waves cannot pass through liquids or gases - only travel through solids - Solely Solids.